We’ve had several builders inquire about putting fins on their boat; specifically on the Squirt. The following notes should allow you to make a more informed decision as to whether to use a fin or skeg. Why use either? You don’t have to, many builders don’t. At low speed, you may not see a need. But at higher speeds, when you are demanding more from the hull, it can noticeably slide in turns. So which is best? Fins are a pain in the neck. They make the boat more difficult to put on a trailer and are vulnerable in shallow water. But a fin gives the hull a pivot-point and prevents the hull from sliding in a turn. The hull will be more maneuverable. A fin allows you to make sharper turns and would normally be used on racing hulls. Fins are installed on the centerline of the hull, at approximately the center of the waterline length. When multiple fins are used (on larger hulls), they are installed in-line, on the centerline. They are installed fairly close together; again, centered on the waterline length. Most often they are through-bolted, with nuts and washers on top of the keel. They are sometimes screwed in place on small boats with long screws. Fins are added after the hull is fiberglassed and painted, so can always be added at a later date, if needed. A skeg, or outer keel, is a longitudinal wooden member installed on the centerline after fiberglassing, but usually before painting. A skeg works somewhat differently than a fin. It prevents skidding, but also gives the hull more directional stability; the boat will tend to go in a straight line. Turns will be wider and the hull will not be as responsive to quick maneuvers. The skeg is much lower profile so trailering is easier and beaching is possible. It is important that the skeg end well before the transom to prevent cavitation. As a general rule, it ends at least 18″ in front of the transom. The forward end usually stops short of the point where the stem starts to curve upward. On a boat like the Squirt, the skeg would be made from 1″ (3/4″) x 2″ material, tapering from 1/2″ at the forward end to the full 2 inches at the aft end. The aft trailing edge is given an airfoil shape, again to reduce the possibility of cavitation. It is extremely difficult to fiberglass over a skeg, so it is usually only painted or varnished. Two or three coats of a high-solid epoxy, like our Poxy-Shield, will make it more resistant to abrasion, but will not offer the same protection as the cloth on the hull bottom. 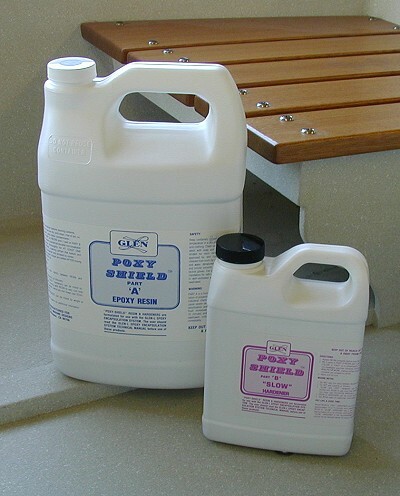 Glen-L Poxy-Shield, 5 to 1 epoxy for laminating fiberglass cloth, coating and as an adhesive with fillers added. Skegs are installed in one of two ways: permanent or semi-permanent. The first is installed with an adhesive such as our Poxy-Shield, with a filler such as #1 Silica added to insure that there is positive contact at all points. It is advisable to form the epoxy that squeezes out around the edges into a small fillet. The second option uses a mastic or marine caulking/adhesive to install the skeg. This makes it easier to replace the skeg if it is damaged, and may be preferable if you plan frequent beaching. With either method, the skeg is drilled for screws, counterbored and screwed in place. The holes can be filled with wood plugs made with a plug cutter or filled with putty. If you plan on making the skeg replaceable, you may not want to counterbore so that the screws can be removed. Deep vee hulls tend to skid less and frequently do not require a fin or skeg. The deep vee provides somewhat the same characteristics as a skeg. Either a skeg or fin can be used on the Squirt. On a small boat like this, the skeg should end approx 18″ forward of the transom to prevent cavitation. The skeg is cut from 3/4″ thick material, tapers from approx 1/2″ at the forward end to 1 1/2″ aft. Give the trailing edge an airfoil shape. See drawings below from other sets of plans. We built our Riviera without a fin originally. However when turning it slid. Next winter 3 fins were added under the motor and the control improved immensely. The boat no longer slid in the turns and held whether pulling 1 skier or 3. It is also great fun to pull “power turns” and soak the folks in the rear cockpit. Great feedback, Mark. Thank you! Would you provide a person to come abroad to build a boat say 15’ feet. A rowing one and how much approx. cost only labor charge? Adel, we don’t build boats but we do have plans for you to build your own–see our online catalog for options: https://www.boatdesigns.com/Boat-Plans-Kits-Catalog/departments/2/ We ship our plans all over the world.